Despite her draconian politics, it was Hasina’s economic policies that saw the world applauding her return. Power supply in villages has boosted irrigation in the vast rural interiors of the country. Many questions are being raised about the recently concluded general elections in Bangladesh — and for good reason. 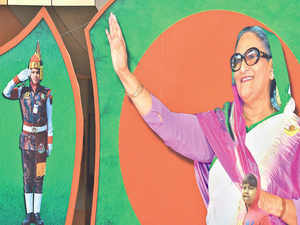 The manner in which Prime Minister Sheikh Hasina and her party Awami League have stormed to a third consecutive term in office — their fourth stint in power, if the period between 1996 and 2001 is counted — has not only surprised the country but has also prompted the opposition to allege voting irregularities. The Awami League has almost the entire parliament under its control, with the Jatiyo Oikya Front, the opposition alliance of which the Bangladesh Nationalist Party is a component, being reduced to just seven in a House of 300. The opposition, led by the former foreign minister Kamal Hossain, has refused to accept the results and has decided to file a petition with the election tribunal, seeking a review of the poll outcome. The seven elected members of the opposition alliance have refused to be sworn in as lawmakers, further complicating the political process. However, the election seems to have been accepted by and large outside the country despite reservations about the many ways in which the opposition was prevented from campaigning in the run-up to the vote. Many nations have called on the government in Dhaka to investigate reports of anomalies, but have acknowledged the reality of Hasina being in power for the next five years. Indians, Chinese and Russians have cheered the ruling party for holding on to power for 10 continuous years since 2008. This has a lot to do with the performance of the Awami League government in a number of socioeconomic areas despite the way it clamped down on free speech and democratic ways of expression. Despite her draconian politics, it was Hasina’s economic policies that saw the world applauding her return to power. Over the past decade, Hasina’s administration implemented a policy of zero tolerance on Islamist terrorism as top priority. It was especially so after the Holey Artisan Bakery attack in 2016, when the government went out on a limb to exorcise the country of bigotry. The relentless assault on religious fanaticism has had a positive effect in that investors, both at home and abroad, have felt confident enough to engage in uninterrupted economic activity. Just how grateful the business classes happen to be to the government was on display a few days before the December 30 election, when a large number of influential business leaders came together, in Hasina’s presence, to make an unprecedented, public declaration of support. Since 2008, the government has also vigorously promoted a policy of women’s empowerment, as a result of which a greater number of women have been making their way to professions, including civil services as well as armed and security forces. Women entrepreneurs are growing. Many young women are leaving their jobs as housemaids and joining readymade garment units, which they find satisfactory in terms of workplace security and wages. Thanks to the attention given to the readymade garments sector by the government, it has fared well despite competition from other countries. Second, agriculture has been a success under minister Matia Chowdhury. The spectre of hunger or a shortfall in food supplies and production is a thing of the past, which again is proof of the pragmatic policies in terms of agricultural subsidies and other incentives the government has been implementing in the last 10 years. Third, power supply and distribution has transformed under the Sheikh Hasina government. More parts of the country have been electrified. Where power failure was a given, it is now a rarity. Power supply in villages has boosted irrigation in the vast rural interiors of the country. Fourth, remittances from Bangladeshis working in regions such as the Middle East and Southeast Asia have gone up, with the appreciable result that families that were trying to make ends meet are now well-off, with their children getting a decent education. One must also note the multifarious ways in which the internet, especially ecommerce, has boosted the quality of life. More than half the population of 16 crore, perhaps more, has access to the internet. through a growing use of mobile phones. Such achievements are in line with the programme of Digital Bangladesh which Sheikh Hasina’s government has been emphasising over the years. Fifth, the rapidity with which road transport has grown has been impressive, easing traffic movement in Dhaka and linking diverse regions of the country. Sixth, despite the very legitimate grievances which have been cited where the performance of the banking sector is concerned, the government’s stress on earning revenues through tax collection has gradually been paying off. Though it cannot be said that the number of citizens paying taxes to the state exchequer has gone up significantly, it is certainly remarkable that people have been educated on the requirement to pay taxes. All of these are a window to the policies Sheikh Hasina has been pursuing over the past decade. They do not, of course, answer questions regarding the kind of politics her government has presided over during the period. In her unprecedented fourth term in office, the prime minister will need to emphasise such critical issues as rule of law, the strengthening of institutions, media freedom and overall democratic expression and a functional parliament if she means to leave a lasting legacy behind.